If you are like most folks who read Petful, you want only the best for your pet, and that includes when he is groomed. This means you want to find the best groomer you can to ensure that not only does your dog or cat look great, but he stays healthy as well. The problem is that there are hundreds — if not thousands — of pet groomers, so how can you find the best one? Answer: By making sure your groomer has the right qualifications. In this article we’ll discuss some tips for choosing a great groomer. Although training is not required in order to become a dog or cat groomer, it is generally better to opt for a groomer who has completed some training. There is everything from in-house training to internships and even grooming schools, so if you want a groomer with training, you should have plenty of options. 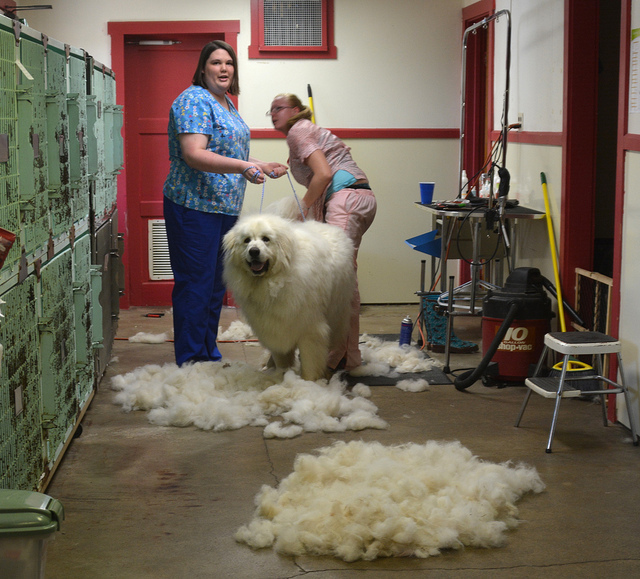 Most groomers start off as bathers and spend time watching the experienced groomers, but it all depends on the individual as well as the grooming company. Although there can be top-notch groomers who started working right away, those who do better jobs will usually have had training. Not all groomers will have certification and just as training is not necessary, neither is certification. However, if you want a top-caliber groomer, finding one who is certified, such as by the National Dog Groomers Association, will guarantee he or she has the necessary skills. In order to receive these certificates, groomers will have to pass tests and show knowledge of techniques and safety concerns such as first aid. [contextly_sidebar id=”7403a2b26c20a0feb62231ea9a2b37c6″]When you start looking at groomers, you will quickly realize that there are several professional organizations. These groups usually send out newsletters and work to keep their members updated on everything from health and safety to styling trends. Although there is no legal requirement for a pet groomer to belong to one of these organizations, if you want one who will be updated on health and trends, you should try to pick one who does. Once you think you have found the right groomer, go into her store or salon. The most important thing to look for is overall cleanliness. Pay attention to not only how clean things look, but also whether or not it smells (but be prepared for a bit of wet dog smell). Try to see if there are fleas — if they are present, stay away. Also pay attention to where the groomer leaves the animals when they are waiting to be groomed and then where they are kept after grooming. If you aren’t comfortable leaving your dog or cat there, keep looking for a groomer. One of the best signs of a top-notch groomer is if she asks you questions. These should be related to your dog or cat and his health — things such as how old the pet is, whether he has any allergies or health concerns, and which vaccinations he has received are the most common concerns. The groomer should also ask for your contact information in case an emergency occurs. All this information is important as it will allow the groomer to take good care of your pet and keep him healthy. Although almost all groomers will give your dog or cat a bath and then a trim, some will provide other services as well. Check if the groomer works with pets with matted fur even if your dog or cat doesn’t have it, as this will show expertise. Some will provide other services such as trimming or filing their claws or cleaning their ears. If you just want a simple bath and cut, all these services aren’t necessary — but if you think you may want them, always opt for a groomer who offers them. Even if you don’t want the services, the fact that your groomer can do them shows experience and knowledge.